Well, what can I say, except for that I’m so excited to announce that I’ve accepted an invitation from The Hawkhills to become one of their preferred wedding photography suppliers. It’s such a great honour to have been asked, and of course there’s no way I could refuse such an opportunity to work alongside wedding coordinators Kasha and Sophie, whom I met last month after agreeing to do some aerial photography for them. I loved the character of the building so much that we got chatting about the history and what they offer in terms of a wedding venue, and I just love it. Kasha was kind enough to give me the grand tour of all the rooms, including the incredible bridal suite. This is a must see; complete with a grand king size bed, deluxe en-suite and stunning roll top bath. Its period style offers a suite that you really don't want to escape from. You'll find a sumptuous bathroom (tip: the standalone bath is worth choosing this venue alone! ), and is complete with a stunning dressing room which is perfect for all your bridal preparations on your wedding day. And, in terms of your photography, there's plenty of space and light to work with so there's an opportunity to capture some beautiful photos from your morning preparations. If you’re aiming for a much more intimate gathering on your wedding day, The Hawkhills has you covered with ‘The Garden Room’. It accommodates for 20 guests and you’ll benefit from stunning views across the landscaped gardens and manicured lawns of The Hawkhills. And, if love the room but have more than 20 guests then don’t worry, you can extend your space in to The Oak Room without any trouble. Whatever it is you're looking for, The Hawkhills offers enough variety to suit your needs. We took a walk outside where Kasha introduced me to the walled garden, and it's an absolute treasure. I couldn't believe the huge space available and how intimate the setting is. I immediately thought 'marquee', and according to Kasha you can easily set this up, with various sizes being accommodated. There's a stunning, romantic tree lined setting that you can build around or incorporate in to your chosen setting, but I strongly recommend that you take the opportunity to visit to see how the high walled garden and orchard will impress you and your guests. 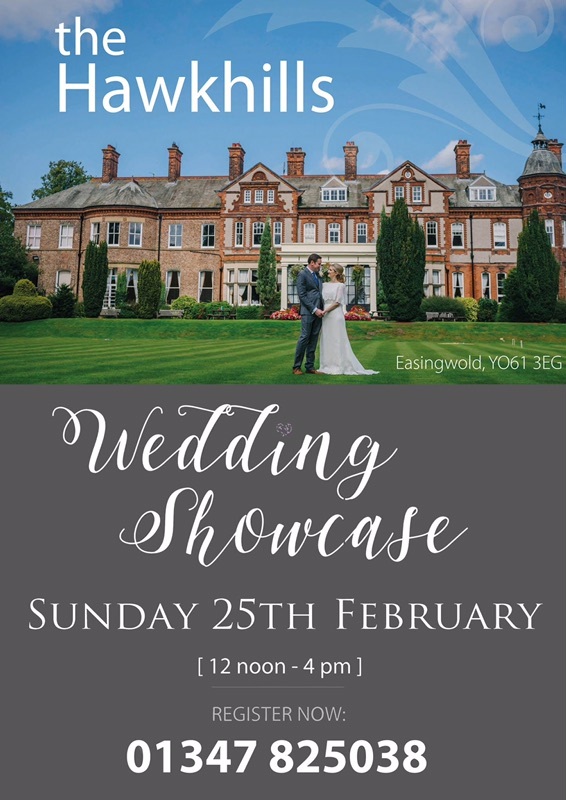 I’m so pleased to be joining the team at The Hawkhills, and to celebrate my first wedding open day there on 25th February 2018, I’ll be offering some truly great introductory deals along with bottles of prosecco for those who book their wedding date in my diary on the day! ...of the rest by signing up to our Wedding Showcase special and get early access to upcoming deals. Bookings taken on a first come, first served basis. Sign up today and beat the rest. Don't miss out, get great savings on great photography! Come along to say hello, see some samples of my work, and to find out about exclusive deals being offered on the day. Package deals offered on a first come, first served basis. Don't miss out! The Hawkhills Wedding Venue in Easingwold, North Yorkshire, YO61 3EG.